The Democratic Socialist Labor Commission (DSLC) is the body within DSA responsible for directing its work in the labor movement. 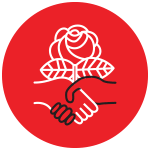 The DSLC is tasked with fostering the birth and growth of chapter-based labor working groups which can support a rank and file movement, providing a central node of labor-related organizing resources, advising DSA's National Political Committee on matters relating to labor, and building channels within DSA for labor activist networking and discussions of the challenges faced by socialists in their workplaces. The DSLC is made up of DSA members active in the labor movement, whether as union members and stewards, union staff, workers center activists, union officers, labor journalists, union retirees, students in labor solidarity groups, labor-oriented intellectuals, or in any other role in the movement!